Politricks: is Anonymous immortal, are its methods supernatural? The greatest thing to happen to politics in the Twenty-First Century isn’t political at all. Politics, so-called, is far too boring to have much effect on anything these days. It shall be in the domains of technology, culture and “the press” (so-called) that the real power struggles will take place in the Twenty-First Century. There is a battle for the mind, as always, but it is far more divorced from brute force or “hard power” than it was in the past. The wars of the Twentieth Century were fought on battlefields, but there not for battlefields but for hearts and minds. Now, this battle for ideas can be fought not by soldiers and statesmen but literally by ideas, in a world consisting of information. I am provoked to write this as an addendum to something I recently mentioned in an a previous post on this blog, last week. In that post, I mentioned how in the past, symbols of piracy like the Jolly Roger, and Guy Fawkes’ image, were vilified. As the boundaries between forums and groups have blurred, collectives such as Anonymous appeared, capable of actually campaigning for social change. At first, of course, Anonymous directed most of its wrath against the Church of Scientology – a trail I followed closely during my university years. Later, Anonymous became more politically conscious, eventually striking at government websites and taking the side of WikiLeaks during its standoff against the US government – a standoff that still hasn’t ended. Of course, the reality is that the likes of Anonymous and WikiLeaks are actually fairly neutral when it comes to matters of politics and power-mongering. They don’t have any plan to govern society or remove incumbent governments from power. Rather, such groups simply enable those people – including those within the government’s own ranks – to make life difficult for the offending regime or organization that is thought to have betrayed the public trust. While WikiLeaks has its own story as the work of a brilliant “cypherpunk” – Julian Assange – Anonymous is far more elusive. Anonymous marks its presence through the use of cultural icons, with the most common being the Guy Fawkes mask and various pirate flags (these in turn tied to the Pirate Bay and supportive “Pirate Parties” that have emerged in Europe). Anonymous protesters and commentators say the Guy Fawkes mask symbolizes the power of the people, evoking its use in the graphic novel and movie V for Vendetta. 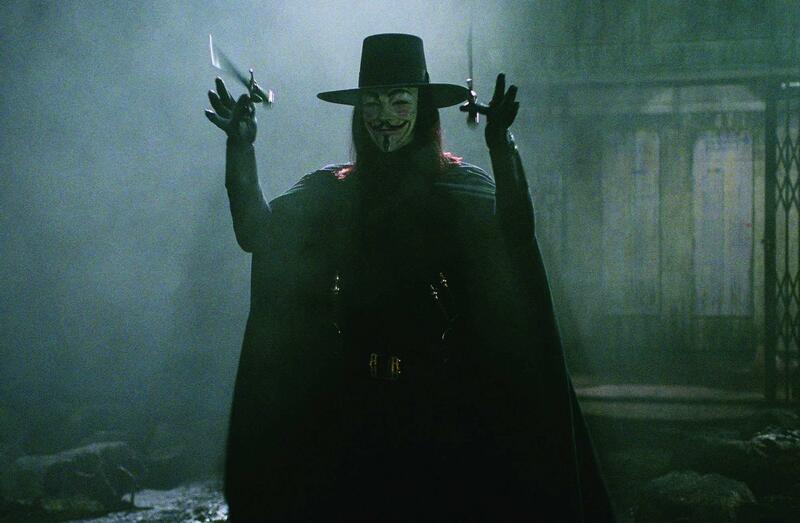 V is a dark knight, similar to Batman in Christopher Nolan’s films, who cloaks and masks himself to protect others, and to ensure that his own life is irrelevant and that the symbol of his resistance will live on beyond his own death. Members of Anonymous see themselves as similarly covering their own faces and individuality for the good of the collective, as the grin of the mask will live on forever – no matter how many of them are imprisoned or even killed by repressive regimes. It is an alluring and powerful image. The Guy Fawkes mask and pirate flags were mentioned by me in my previous post. They evoke images of defiance against government authority, and have interesting histories behind them that still influence the feelings we have about them, even if we don’t know the histories in detail. Guy Fawkes attempted to blow up the Houses of Parliament. Pirates who flew black flags were once hunted outlaws – the most famous of whom was Edward Teach. Both Fawkes and Teach (“Blackbeard”) were once the most villainous names spoken in England, for their defiance of the Crown. Today, they are seen in a more comical light, as the political grievances against them have ultimately perished with time. Electronically circulated symbols and memes can have far greater significance than we may anticipate. They are capable of capturing the imaginations of millions of people beyond the control of any government, and have potentially replaced the traditional old school methods of political party formation and insignia as ways of generating mass brand awareness and recognition. In a world dominated by social media and online fora, governments have far fewer reasons to worry about specific political groups and their members than about everyone and the forums they may have visited. Some agencies such as GCHQ in the UK and the NSA in the US have managed to “master the Internet” (so they say) after they detected possible troubling security implications of the Internet for them. But the political system and the old men at its helm are still decades – if not centuries – away from truly adjusting to the reality of the internet. The nation-state may be too brittle to actually survive the transition that it must ultimately face at the hands of unrestrained communication and circulation of ideas and property.